Welcome back. Many years ago, I could walk, chew gum and manage three or four thought-required actions simultaneously. 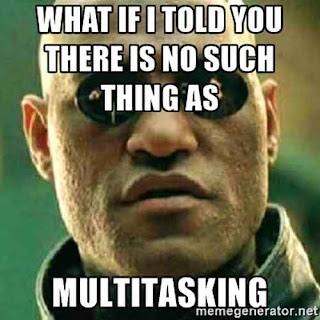 I was proud of my multitasking ability and wholly deflated when studies showed multitasking was a myth, it doesn’t happen. 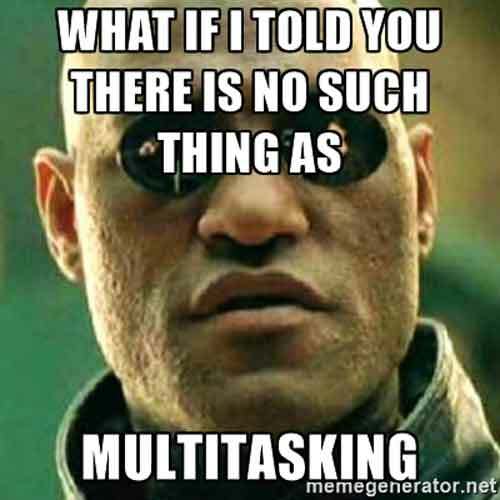 Morpheus knows that multitasking is a myth (from discovery.insidify.com/memesday:-you're-not-multitasking,-here's-5-things-you're-doing-instead). Alas, like every other multitasker, I was not doing multiple tasks that require mental consideration simultaneously; I was just switching my attention from task to task very quickly. Now that that’s clear, let me tell you about the benefit of letting people think they’re multitasking. 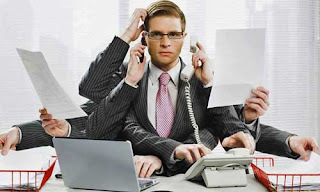 Although engaging in multiple tasks usually worsens performance, a recently published study found the perception of multitasking improves performance. Investigators from Michigan, Pennsylvania and Yale universities conducted 32 tests involving over 8,200 participants. Their general approach was to compare performance when participants perceived the exact same activity to be multitasking or single tasking. For example, one test had 162 participants (62% female; mean age 21) watch and transcribe an educational video. Half were told they would be working on two tasks concurrently (learning task, transcribing task) and would need to multitask. Half were told they would be working on a single task meant to test individuals’ learning and writing abilities. Participants assigned to the multitasking condition performed better than those assigned to the single-tasking condition on the two measures of test performance--the number of words transcribed and a pop-quiz on the video’s information. In another test, 110 participants (61% female; mean age 23) took the same virtual tour of an art gallery that exhibited paintings and sculptures by various artists. An auditory description of the history and style of the art accompanied the virtual tour. Participants assigned to the multitasking condition were told the tour would involve multitasking between observing the visual component and listening to the auditory component. Those assigned to the single-tasking condition were reminded they would observe the visual component and listen to the auditory component but were not told this entailed multitasking. Following the tour, multitasking participants scored significantly better on 29 questions about what they learned (saw and heard) during the tour. They also reported the tour was significantly less boring. As another example, 237 participants (55% female; mean age 36) worked up to four minutes on two word-puzzles: one to find as many horizontal, vertical or diagonal words as possible in a 15x15 letter matrix; the second, an anagram to come up with as many words as possible using the letters in a 10-letter string. The two puzzles appeared side-by-side on the same screen. Participants assigned to the multitasking condition saw the two puzzles with different color backgrounds and separated by a vertical line, and they were told the two tasks were different. Single-tasking participants were told both tasks were part of the same test, and the puzzles they saw were not differentiated by background color or a line. Participants assigned to the multitasking condition submitted, on average, more words and they persisted longer than those assigned to the single-tasking condition. To explore the differences further, eye movements and pupil dilation of 115 participants were tracked while working the word puzzles. Participants assigned to the multitasking condition exhibited greater physiological signs of engagement than did those assigned to the single-tasking condition. The researchers emphasize that their findings complement rather than contradict the extensive research demonstrating the detrimental effects of multitasking. if it improves your performance. Multitasking is often a matter of perception. Participants who perceived an activity to be multitasking were more engaged and thus outperformed those who perceived that same activity to be single tasking. Making people think they are multitasking as opposed to single-tasking may well improve performance.